Team Ecology will be wrapping up and braving the cold to SleepOut at Bradford City FC to raise money for Centrepoint, the UK’s leading youth homelessness charity. Together with their partners, Centrepoint supports more than 10,000 homeless young people each year. They help vulnerable young people by giving them the practical and emotional support they need to find a job and live independently. Every day Centrepoint supports 150 homeless young people aged 16-25 in Bradford alone. Seven colleagues from across the Society will be spending a winter’s night sleeping out in the cold, whilst raising money and awareness for young people facing homelessness, on Thursday 22 November. While the events don’t replicate homelessness, it is a challenge with participants enduring a cold and uncomfortable night’s sleep. The team are hoping to raise more than £1400 for Centrepoint with part-matched funding from Ecology. If you would like to support the Ecology team at SleepOut Bradford you can donate here. 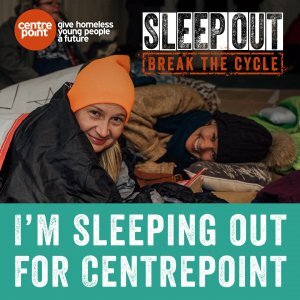 Click here to find out more about Centrepoint SleepOut.